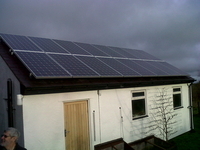 There has been an insignificant rise in the amount of people opting for Solar Energy systems in recent years. And it's not surprising with the amount of benefits that Solar Energy offers. A Solar Energy system can work independently; it does not require a power connection, or gas grid. This means that solar systems can be installed in remote locations like log cabins, which also cuts costs of supplying a new electricity supply to a site.